Pure 24/96 gris-gris from the night tripper. In the 1980s, Mac Rebbenack (aka Dr. John) tracked two full albums for the Clean Cuts label. 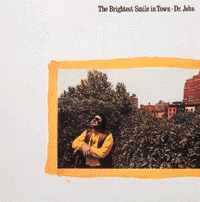 Brightest Smile was recorded in New York City in the fall of 1983. The second, Dr. John plays Mac Bebbenack will also be released on DAD by year's end. A new Orleans native, Rebbenack's gumbo drenched, voodoo-hoodoo from the swamp is strictly "all heart and no gimmicks" as the liner notes state.